Powered by a CMOS sensor, the Velocity™ EBSD Camera Series combines indexing speeds up to 4,500 indexed points per second with indexing success rates of 99% or better. At these speeds, the Velocity™ cameras use 120 x 120 pixel EBSD patterns for improved band detection. This image resolution, combined with proven EDAX triplet indexing routines, provides orientation precision values of less than 0.1°. The Velocity™ EBSD cameras can be integrated with compatible EDAX EDS detectors to provide an analytical system for efficient simultaneous EDS-EBSD collection, even at the highest collection speeds. Furthermore, combining the collection with EDAX ChI-Scan™ analysis results in useful integrated data for accurate phase differentiation. This new addition to the EDAX portfolio of EBSD cameras offers users another option for high-speed mapping and accurate indexing to resolve crystallographic microstructures and help solve materials characterization challenges quickly and easily. For further information, please join our upcoming webinar, Applications of High-Speed CMOS Cameras for EBSD Microstructural Analysis, visit www.edax.com/velocity or email EDAX at info.edax@ametek.com. 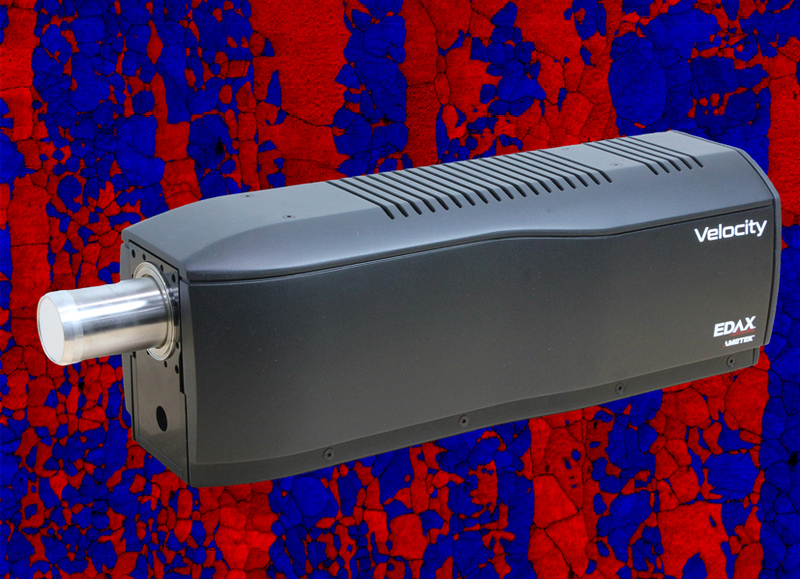 EDAX is an acknowledged leader in Energy Dispersive Microanalysis, Electron Backscatter Diffraction and X-ray Fluorescence instrumentation. EDAX designs, manufactures, installs and services high-quality products and systems for leading companies in the semiconductor, metals, geological, pharmaceutical, biomaterials, and ceramics markets. EDAX is a unit of the Materials Analysis Division of AMETEK, Inc., which is a leading global manufacturer of electronic instruments and electromechanical devices with annual sales of approximately $5 billion.